Based in Dallas, Beckett Publications is the leading publisher of sports and entertainment market collectible products in the world. Beckett operates Beckett.com (www.beckett.com), the leading online destination for sports collectible enthusiasts, and is the premier publisher of monthly sports collectibles magazines. Beckett, considered the world’s most trusted source in collecting, currently publishes nine monthly magazines. Its flagship title is the popular Beckett Baseball. The company also operates Beckett Grading Services, a leading third-party professional sports card grading service. The company was founded in 1984 by Dr. James Beckett. In the mid-1970s, while a statistics professor at Bowling Green State University, he published his first baseball card price guides as “free-upon-request” pamphlets to, in his words, “bring order out of the chaos that existed” in the baseball card industry. Those pamphlets led to annually published price guide books and were the forerunners of Beckett’s monthly collectibles magazines. Formed in 2004, Apprise Media (www.apprisemedia.com) is a strategic management and development company. Controlled by Charles G. McCurdy, a co-founder and former President of Primedia Inc. (NYSE: PRM), Apprise Media acquires and builds businesses in the targeted media and publishing sectors. 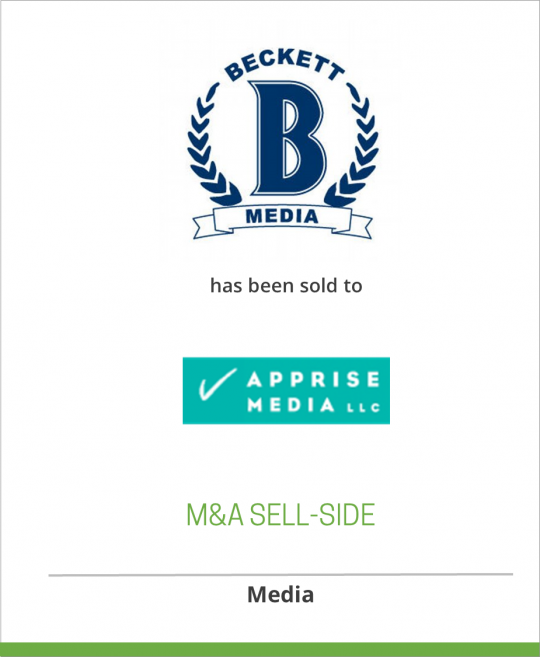 Apprise and Spectrum Equity Investors (www.spectrumequity.com) have joined forces in an investment initiative that has committed $175-$200 million of Spectrum’s capital for strategic investments in niche media and publishing businesses. Spectrum Equity Investors is a private equity investor specializing in investments in companies in the media, information services, communications, information technology and business services industries. Founded in 1994, Spectrum manages private equity funds representing $3 billion in committed capital.